Ken Vandermark as big bandleader; here was an element of the workaholic American’s repertoire that I hadn’t previously heard. Needless to say the saxophonist is no stranger to large ensembles, having for years played a key role in Peter Brötzmann’s Chicago Tentet. And while the Resonance Ensemble has certain formal similarities to that formidable aggregation – many-headed reed and brass sections, bass, twin drummers – it’s also a jazzier, more swinging collective than the Tentet. Those qualities were much in evidence at a reasonably full, but by no means packed (it being a Monday) Porgy & Bess, still my favourite live music venue in Vienna. The opening 30-minute section was a kaleidoscopic swirl of moods, kicking off with a long, devastating tenor solo from centre-stage sax man Dave Rempis. As the piece wore on, it morphed into a graceful and flowing ensemble piece in which each musician was given a chance to shine. 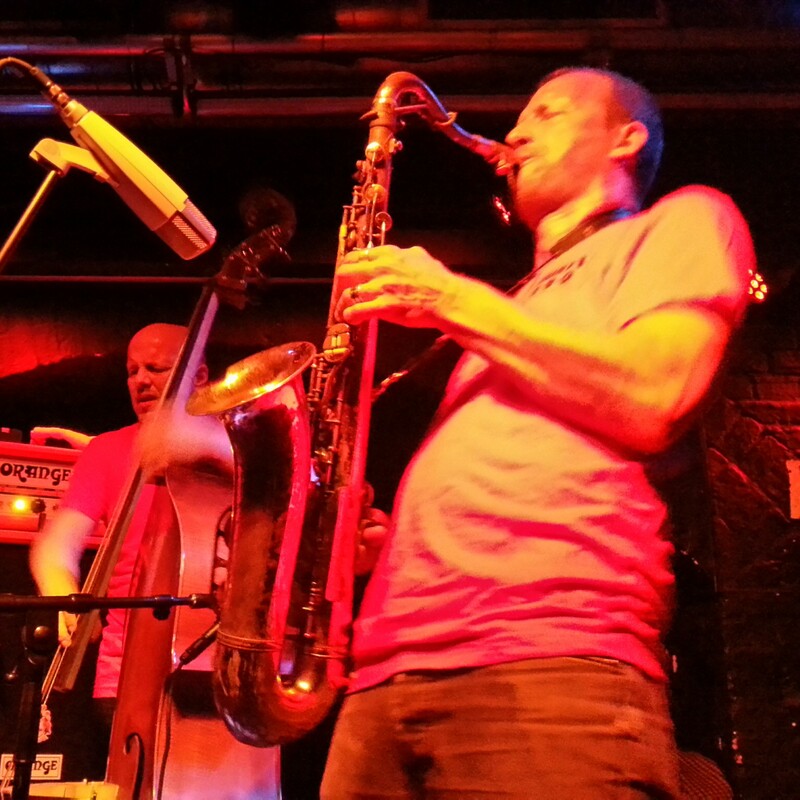 Having experienced Vandermark mostly in full-on improv mode alongside the likes of Brötzmann, Mats Gustafsson and Paal Nilssen-Love, it was salutary to see him work in a more composed environment. Every so often he would give signals to the rest of the ensemble, presumably to communicate some desired course of action, while the music stands dotted around the stage carried the implication that the music was at least partly prepared in advance. Whatever the extent of composition, though, the music was never less than fresh and immediately appealing. The second set saw the group leap headfirst into its most positively enjoyable territory, and this was the part of the evening that seemed to bear Vandermark’s imprint most strongly. There’s no finer sound in jazz than when he crashes into a delirious, overdriven melody and tussles with it into oblivion, and when that sound is reinforced by nine other gifted musicians, responding to his lead with their own joyous contributions, the results are simply overwhelming.